I often highlight inspirations that I find in my virtualwanderings. However, inspiration comes in all shapes and forms. Sometimes its something I see walking past me on the street. Sometimes its something I read. Sometimes its something that comes in a dream. But nothing beats the inspiration that comes from working alongside other craftspeople. To say I am lucky, grossly understates how I feel about having Kerstin as a friend. The woman watches my child, cooks me dinner, helps me clean up and to top it off, she is a crocheting wizard (oh and she got Ellis his favourite birthday gift)! To have Kerstin AND Jude as craft-spirations has fueled my own creativity beyond words. Plus, Kerstin's creativity has kept me warm and stylish all winter! 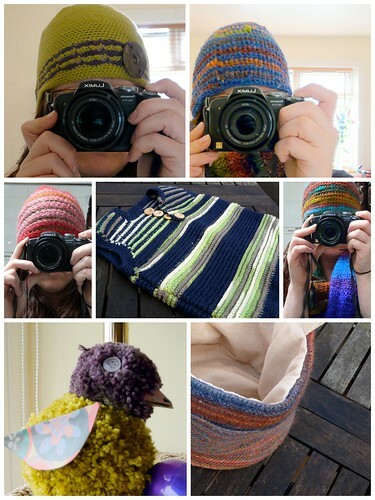 Our house is full of her beautiful work - hats, scarves, bucket, expensive yarn-chick. Each one is a masterpiece that she makes and remakes to be perfect. I have learned a lot about colour, technique and obsession from my dear friend. Thank you, Tantie. For everything.